We’d love your help. Let us know what’s wrong with this preview of Blue Ocean Strategy by W. Chan Kim. Since the dawn of the industrial age, companies have engaged in head-to-head competition in search of sustained, profitable growth. They have fought for compet The global phenomenon, embraced by business worldwide and now published in more than 40 languages. To ask other readers questions about Blue Ocean Strategy, please sign up. Is this book a LARP? What is the main theme of the book? And is there a common theme with Porter's 5 competitive forces that shape strategy? Thank you! The signal-to-noise ratio of business books generally tends towards zero. They fall into one of three categories: baked-over platitudes designed to reinforce the self-esteem of the reader (see First Break all the Rules), laughably faulty reasoning (see Good to Great), and interesting ideas that are overextended and driven into the ground (see The Tipping Point). Fortunately for Blue Ocean Strategy, it tends towards the latter. There are a few good ideas in the book, but they are shrouded in unnec The signal-to-noise ratio of business books generally tends towards zero. They fall into one of three categories: baked-over platitudes designed to reinforce the self-esteem of the reader (see First Break all the Rules), laughably faulty reasoning (see Good to Great), and interesting ideas that are overextended and driven into the ground (see The Tipping Point). Fortunately for Blue Ocean Strategy, it tends towards the latter. There are a few good ideas in the book, but they are shrouded in unnecessary jargon and applied precariously to far too many companies. It uses the holy grail of business books: create a structured, numbered framework for analysis (see The 7 Habits of Highly Successful People or The 21 Indispensable Qualities of a Leader or at least 1000 others) and then cherry-pick examples that can fit into the framework (see Built to Last). All this aside, the fact that is directionally correct in advice and contains some thought-provoking ideas earns it a couple of stars. Unfortunately, I may never be able to sell my business book idea: It's All Due to Luck and Nepotism. ببساطة الكتاب بيقترح عليك اكتشاف مجال جديد و الخوض فيه و انشاء سوق له ، و توفير جهد المنافسة فى السوق الحالى .. و بيطرح عليك الامكانيات و الخيارات الهائلة التى قد يوفرها لك هذا الاكتشاف ، و التى قد تصل فى اتساعها الى سعة المحيط الازرق .. انه يقترح عليك اختيار اللون الازرق :) ، ايضا ذكر عدة نماذج و امثلة قد تساعدك فى السعي وراء هذا الاكتشاف فى مجال عملك .. This is an especially thought-provoking book that, as have so many others, evolved from an article published in the Harvard Business Review. According to Kim and Mauborgne, "Blue Ocean Strategy challenges companies to break out of the red ocean of bloody competition by creating uncontested market space that makes the competition irrelevant...This book not only challenges companies but also shows them how to achieve this. We first introduce a set of analytical tools and frameworks that show you how to systematically act on this challenge, and, second, we elaborate the principles that define and separate blue ocean strategy from competition-based strategic thought." The material provided by Kim and Mauborgne is essentially worthless, however, unless and until decision-makers in a given organization accept their challenge, are guided and informed by the six principles, and effectively use the tools within appropriate frameworks. The responsibility is theirs, not Kim and Mauborgne's. To assist their efforts, Kim and Mauborgne focus on several exemplary companies that have dominated (if not rendered irrelevant) their competition by penetrating previously neglected market space. They include the Body Shop, Callaway Golf, Cirque du Soleil, Dell, NetJets, the SONY Walkman, Southwest Airlines, Starbucks, the Swatch watch, and Yellow Tail wine. All of these Blue Ocean strategies created new or much greater value for customers. Their emphasis is on the quality of experience, not on the benefits of a new technology. According to Kim and Mauborgne, their research indicates that "the strategic move, and not the company or the industry, is the right unit of analysis for explaining the creation of blue oceans and sustained high performance. A strategic move is the set of managerial actions and decisions involved in making a major market-creating business offering." The cornerstone of a Blue Ocean strategy is value innovation that occurs "only when companies align innovation with utility, price, and cost positions. If they fail to anchor innovation with value in this way, technology innovators and market pioneers often lay the eggs that other companies hatch." For Kim and Mauborgne, value innovation is about strategy that embraces the entire system of a company's activities. It requires companies to orient the whole system toward achieving a "leap" in value for both buyers and themselves. Kim and Mauborgne explain HOW to create uncontested market space wherein competition is essentially irrelevant. Kind of a stupid book. The overall premise is, don’t compete directly with your competitors, create new markets. Of course, it falls into the classic trap that all business books seem to fall into, which is looking only at cases that support the theory and ignoring all that don’t. The theory itself is pretty obvious when you look at it - basically it argues that making a profit in any commodities market boils down to reducing costs, and that when your competitors cannot directly compete against Kind of a stupid book. The overall premise is, don’t compete directly with your competitors, create new markets. Of course, it falls into the classic trap that all business books seem to fall into, which is looking only at cases that support the theory and ignoring all that don’t. The theory itself is pretty obvious when you look at it - basically it argues that making a profit in any commodities market boils down to reducing costs, and that when your competitors cannot directly compete against you, you will make much more money. This is essentially the classic economic picture of perfect competition vs monopoly, and is quite obvious. The authors provide case studies on how some companies left their "bloody-red" oceans of competition for completely open blue oceans where they were unique. Some are well-known business stories, such as Southwest Airlines becoming a low-cost provider. However, the book provides details into Southwest's underlying business strategies that may not be well known. Other case studies gave new insight into various companies and their product strategics. One interesting story, for example, was [yellow The authors provide case studies on how some companies left their "bloody-red" oceans of competition for completely open blue oceans where they were unique. Some are well-known business stories, such as Southwest Airlines becoming a low-cost provider. However, the book provides details into Southwest's underlying business strategies that may not be well known. Other case studies gave new insight into various companies and their product strategics. One interesting story, for example, was [yellow tail], the Australian wine company that stepped outside of the traditional wine marketing with a simpler offering targeting casual drinkers. How to win the competition? You can challenge your opponents on a head-to-head competition. Suppose that your target is to book 200 contracts each month. In order to fulfil the target you can compete on pricing. It means that you should give bigger discount than your opponents. But head-to-head competition has its own limitation. There is another way to compete. A smarter way. Chan Kim and Mauborgne propose another solution: don't compete with your competition, why don't you make them irrelevant! The book idea is to give your customers better services without any head-to head competition. It gives you a framework helps you to re-design your products/services. It helps you find your niches. The book is quite easy to read and has an excellent and brilliant idea. It's a must for anyone responsible in decision making. This well-written book seems like common sense however it is an eye-opener for less sophisticated colleagues who doesn't know much about competitive advantage. It arguments how contested markets ("red oceans") should look for uncontested markets ("blue oceans"). Everything in this book is common sense. Nintendo is another high-profile example. Satoru Iwata, Nintendo's CEO, has referred to the Blue Ocean Strategy in interviews. I do think the Blue Ocean Strategy is nothing without execution though This well-written book seems like common sense however it is an eye-opener for less sophisticated colleagues who doesn't know much about competitive advantage. It arguments how contested markets ("red oceans") should look for uncontested markets ("blue oceans"). Everything in this book is common sense. Nintendo is another high-profile example. Satoru Iwata, Nintendo's CEO, has referred to the Blue Ocean Strategy in interviews. - Electric cars, which were invented in 1899! all my previous comments/critique was encapsulated on 2 appendixes at the end of the book so it confirmed my assumptions rather nicely. I believe he made for him self a blue ocean consultancy business and this book was the start of it? Beyond the Machiaveli political tips , everything else was around a catchy phrase and that what his main message seems to be. Rest are old theories in new color. This book is an essential read for any entrepreneur looking to compete in a saturated marketplace and build a successful business. Too many startups fail because founders try to compete directly with well-established companies that dominate the market. The Blue Ocean Strategy is a book about finding your niche within a niche so you can stay competitive and grow. I remember as a child asking my dad why I should pick up skiing over snowboarding. He responded that while snowboarding was certainly fun, because of its popularity it was also commonplace. Reasonably talented teenage snowboarders were a dime a dozen on any ski hill. Good young skiers, however, were few and far between. Reflecting on the choice between becoming one of the unwashed masses of snowboarders or one of the few, the happy few skiers, I chose the latter. Over the years being a reasonabl I remember as a child asking my dad why I should pick up skiing over snowboarding. He responded that while snowboarding was certainly fun, because of its popularity it was also commonplace. Reasonably talented teenage snowboarders were a dime a dozen on any ski hill. Good young skiers, however, were few and far between. Reflecting on the choice between becoming one of the unwashed masses of snowboarders or one of the few, the happy few skiers, I chose the latter. Over the years being a reasonably good skier has served me well, differentiating myself from many of my peers and has created numerous business relationships and opportunities. Kim and his co-authors take this basic concept and apply it to business. They suggest that positioning one's company away from popular and hotly contested "red ocean" and moving to less frequented "blue ocean" can pay huge dividends. 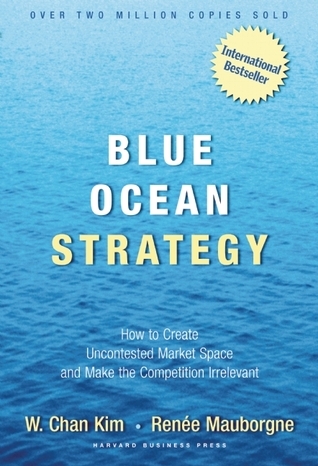 Blue Ocean Strategy differentiates itself from many business strategy books in that it doesn't simply dwell on this semi-novel strategic formulation, instead it includes numerous tools and suggestions for actively moving a company from red to blue ocean. Although some of the suggestions strike me as too esoteric to prove useful in a real business, the majority are simple, straight-forward, and can be utilized as useful thought experiments if nothing else. В отличной бизнес-книге должно сочетаться две вещи: идея, которую можно быстро понять, и практические инструменты для её внедрения. Бинго! «Стратегия голубого океана» Рене Моборна и Ким Чана оказалась именно той самой бизнес-книгой, за которую мне не жаль отданных денег. «Единственный способ победить конкуренцию — это перестать пытаться победить». Вот идея книги. То есть перестать бороться с акулами в конкурентном «алом» океане и выплыть в новый свободный «голубой». В центре этого перемещения ст В отличной бизнес-книге должно сочетаться две вещи: идея, которую можно быстро понять, и практические инструменты для её внедрения. «Единственный̆ способ победить конкуренцию — это перестать пытаться победить». Вот идея книги. То есть перестать бороться с акулами в конкурентном «алом» океане и выплыть в новый свободный «голубой». В центре этого перемещения стоит инновация ценности – предложение потребителю, которое представляет для него новую ценность, а не улучшенную версию старой. Цирк дю Солей как симбиоз цирка и театра. Вина Yellow Tail как пример открытия сегмента вин для массового, а не только нишевого, потребителя. Кроме примеров самих океанов, книга даёт принципы создания «голубых» океанов, инструменты оценки текущей конкуренции и её критериев, пересмотра границ рынка, а также посвящает несколько глав подходу к управления изменениями на практике. Это толковая маркетинговая книга, которая написана нормальным человеческим языком для владельцев бизнеса и топ-менеджеров, и действительно может помочь пересмотреть свои подходы и стратегии. Ну и самое прекрасное, что голубые океаны могут создаваться в любой индустрии, как старожилами рынка, так и новичками. Вопрос только в фокусе и желании. Ну и напоследок совет. Я слушала книгу в аудио – это оказалось ошибкой. В ней настолько много полезных идей и инструментов, что хотелось достать ручку и сразу попробовать их на практике. Так что я рекомендую бумажный вариант, тем более что к нему есть смысл возвращаться. هذا الكتاب عبارة عن إيمان عميق بالتغيير ويحتوي أفكار لا تناسب من يطمح في حياته لمجرد البقاء والاستمرار بشكل ما، إنما هو لم يريد أن يحدث فرقا، وينشئ شركة، تُبنى للمستقبل الذي يربح فيه الزبون كما يربح الموظفون وذوو العلاقة والمجتمع. وهذا كله ليس سهلا ولكنه يستحق المحاولة. يصنف الكتاب المنافسة بين الشركات على المساحات السوقية بمثابة كالمحيط الذي يرغب كل المتنافسين على الحصول على أكبر نصيب منه، ولكن الجديد أنه صنفها باللونين الأحمر والأزرق، حيث أشار باللون الأحمر لتلك الأسواق المكتظة بالمنافسين والتي تعمل على مبدأ التنافس وأطلق عليها المحيطات الحمراء حيث نسبة الخسائر عالية والمساحة ضيقة جدا على المتنافسين. كما أنه أشار باللون الأزرق لتلك المساحات الخالية من المنافسين والتي تعبر عن الشركات التي ابتكرت أعمال ومنتجات جديدة فتحت لها محيطات هادئة وخالية من المنافسين وبعوائد عالية جدا وبدون جهد كبير. وهنا يظهر ابتكار هذا الكتاب الرائع حيث أنه رسم صورة ذهنية عالية لتمثيل كلا من الشركات التقليدية والشركات الابتكارية. وهو الأمر الذي سيركز عليه في الكتاب ليطرح استراتيجيات ووسائل تحقيق الانتقال من المحيطات الحمراء إلى المحيطات الزرقاء. ويذكر أن استراتيجية المحيط الأزرق هي بمثابة تحدي كبير أمام الشركات لتنتشل نفسها من المنافسة الدموية التي تتميز بها المحيطات الحمراء وذلك عبر خلق مساحة من السوق لا منازع فيها بحيث تصبح المنافسة أمرا غير مطروح. ويقوم هذا الكتاب بأكثر من مجرد تحدي الشركات فهو يقدم الطريقة لإنجاز هذا. السؤال الذي يقفز في الأذهان الآن، كيفية إيجاد هذه المحيطات الزرقاء وإحكام القبضة عليها؟! يذكر الكتاب قصة طريفة تسهل علينا إدراك مفهوم المحيطات الزرقاء " وهي قصة سيرك الشمس" الذي قدم مفهوم جديد في عروض السرك وأرباح عالية في الوقت الذي كانت المؤشرات تشير إلى اكتظاظ السوق بمثل هذه المسارح والتي بدأ يقل عليها لإقبال في ظل ظهور أنواع أخرى من وسائل الترفيه. فلقد عمل مسرح الشمس على فنح مساحة سوق جديدة لم تكن مطروقة من قبل وجعلت المنافسة غير مطروحة وخاطب المسرح شريحة جديدة من الزبائن البالغين المثقفين المستعدين لدفع ثمن التذكرة لحضور مثل هذه العروض الراقية فكريا وفنيا. بكل بساطة لقد عرف سرك الشمس كيف يجد المحيط الأزرق بأن حقق التميز وقلل الكلفة عليه وعلى الزبون، وهو جوهر الترفيه، فبدلا من اتباع المنطق المتعارف عليه في الجري وراء المنافسة وتقديم حلول أفضل للمشكلة القائمة وهي تقديم عرض سيرك أكثر وإثارة، بحث سيرك الشمس عن تقديم المرح والإثارة المميزة للسيرك إضافة إلى تقديم المستوى الفكري والغنى الفني للمسرح في الوقت نفسه. فجعل من خلطة المسرح والسيرك منتجا جديدا صنع به مساحة جديدة خالية من المنافسين. ويطرح المؤلفان فكرة ابتكار القيمة وهي حجر الزاوية في استراتيجية المحيط الأزرق، وذلك بأن تنظيم الشركة بين المنفعة والسعر والكلفة بشكل مناسب. هذه المقاربة للنظام ككل هي التي تجعل من خلق المحيطات الزرقاء استراتيجية مستدامة. تساعد استراتيجية المحيط الأزرق في التكامل بين نطاق نشاطات الشركة الوظيفية ونشاطاتها العملياتية. This ise a business school sort of trade book that has been getting a lots of hype. I had to read it for some other purposes so I worked through the book rather than through the numerous HBR articles. The premise of this book is that firms should not bother with messy competition, which will limit their profits and keep them warring with other competitors. Instead, firms should redefine their businesses into new offerings that are appealing to customers but are in such conditions or situations t This ise a business school sort of trade book that has been getting a lots of hype. I had to read it for some other purposes so I worked through the book rather than through the numerous HBR articles. The premise of this book is that firms should not bother with messy competition, which will limit their profits and keep them warring with other competitors. Instead, firms should redefine their businesses into new offerings that are appealing to customers but are in such conditions or situations that other firms cannot easily imitate them. This is "blue ocean" strategy - in which you are the only fish in a big pond. The alternative, of course, is "read ocean" strategy - red because there are other fishes in the pond, whose competition will bloody the waters. Get the analogy?? Examples are provided of firms that have done this and suggestions are made about how to copy them. The writing style is crisp. OK, but the problem is that there is nothing new here. Coming up with a distinctive position that is very attractive to customers and that will justify high prices and good profits is a very old idea. Who wouldn't want to do that? The problem is that finding such opportunities happens most times through a combination of some skill and more luck. The firms that do this, and the examples in the book, have not escaped competition and there advantage does not last for very long on average. Telling someone to go out and follow such a strategy is a little bit like the old joke about the cure to poverty being simple - step 1, get yourself a million dollars; Step 2 . . . The examples are not really helpful. Given a successful firm, it will not prove hard to find a reason why they succeeded. That is not helpful for someone else moving forward. لا أعتبر نفسي قرأت الكتاب وإنما قمت بدراسته، وإعادة قراءة بعض الفصول فيه أكثر من مرة. سمعت عنه منذ أكثر من ٥ سنوات وتوقعت أن تكون النظريات فيه قد أصبحت بالية ولكنها مازالت تتوافق مع وضع السوق اليوم. يجعلك ترى من أكثر من زاوية وتتعلم من الأمثلة الحقيقية المذكورة في الكتاب. كتاب جيد للمهتمين في الإدارة. Modeling disruptive innovation is easier read than done. Blue Ocean Strategy comes with the promise of an absolute shift in how you will think about business and just delivers some new interesting frameworks to add to your toolkit. The idea that competitors are fighting in a red sea of blood while there is always a blue ocean of opportunity is very a powerful visual idea that most readers could feel as absolutely disruptive and inspiring. However is nothing new, it all comes back to the idea of th Modeling disruptive innovation is easier read than done. The idea that competitors are fighting in a red sea of blood while there is always a blue ocean of opportunity is very a powerful visual idea that most readers could feel as absolutely disruptive and inspiring. However is nothing new, it all comes back to the idea of thinking outside of the box, finding a solution that has never been thought of before. But the book comes with the promise of a structural way to deliver and think about how to make this disruption happen. It fails. And the reason it fails is that disruption is by definition unstructured. The book has some clever business frameworks, useful and innovative, but don't expect anything more sophisticated than the classical Porter 4 forces. Blue Ocean Strategy its just a good read if you enjoy business strategy that will enrich your business knowledge. I had to read this book for a strategy class. Business strategy is all about how you intend to differentiate yourself from the competition and how you plan to get there. The premise of Blue Ocean Strategy is, as stated on page 4, "Red oceans represent all the industries in existence today. This is the known market space. Blue oceans denote all the industries not in existence today. This is the unknown market space." So the point of this strategy is to remove your business from the bloody sea of I had to read this book for a strategy class. Business strategy is all about how you intend to differentiate yourself from the competition and how you plan to get there. The premise of Blue Ocean Strategy is, as stated on page 4, "Red oceans represent all the industries in existence today. This is the known market space. Blue oceans denote all the industries not in existence today. This is the unknown market space." So the point of this strategy is to remove your business from the bloody sea of eat-each-other-alive competition and find or create a new field all to yourself. But none of the examples cited in the book have created any "new industries". Southwest Airlines is still an airline. [yellow tail] is still a wine. Cirque de Soleil is still a circus. They do find ways to tap into new or specialized markets. So to me, these companies have more or less sailed to the edge of the red oceans, but they haven't completely left it. What's bothersome to me is that the authors don't have an example of how they or someone else have taken a company through the steps to find that coveted blue ocean. What we have are existing companies who have differentiated themselves from their competition or tapped into a new customer base. So it seems as if the tenets of blue ocean strategy have been reverse-engineered to fit a handful of companies. This seems to be a research project that yielded some similarities between successful companies. This is a very good book. I am reading it for the first time because the new one has come out and I wanted a baseline. The premise is simple most competitors compete in price, variety, quality etc but the profits are slim and market is stagnant. This is called the red (bloody) ocean. To win big, you need to develop the Blue Ocean Strategy, bu looking into unexplored market. For example, Cirque du Soleil had transformed circus performance into sort of a theatre thing, attracting audience who woul This is a very good book. I am reading it for the first time because the new one has come out and I wanted a baseline. The premise is simple most competitors compete in price, variety, quality etc but the profits are slim and market is stagnant. This is called the red (bloody) ocean. To win big, you need to develop the Blue Ocean Strategy, bu looking into unexplored market. For example, Cirque du Soleil had transformed circus performance into sort of a theatre thing, attracting audience who would not mind paying the high price for a nice performance. It also managed to cut costs by doing away with the animals. This is all very well and good, but sometimes success is only obvious after the fact. Even Steve Jobs did not get everything right and had a few products that flopped. It is of course easy to see after the facts, but the only way to develop these blue oceans is to try and try and try again. Practical advice from one of the bosses at the INSEAD Strategy Institute. Sometimes it gets a little self-helpy in the sense that creates its own vocabulary and repeats them ad nauseaum until we can't take it anymore. The references, of course, are dated. But I like its insights. Some reviewers accuse it of nitpicking evidences, but business is already a tricky area for scientific exactness: there is just too many variables, and this book doesn't (nor tries to) cover all of them. This is a book a Practical advice from one of the bosses at the INSEAD Strategy Institute. Sometimes it gets a little self-helpy in the sense that creates its own vocabulary and repeats them ad nauseaum until we can't take it anymore. The references, of course, are dated. But I like its insights. Some reviewers accuse it of nitpicking evidences, but business is already a tricky area for scientific exactness: there is just too many variables, and this book doesn't (nor tries to) cover all of them. This is a book about strategy, not a failure-proof-execution-guide. What a good book for those who are interested in strategy. Very clear examples with many case studies on how some companies get a big profit by leaving the traditional red oceans of competitions for blue oceans where they are unique. it's a little bit unfortunately for me that I've recently read this book while it was actually published more than 12 years ago. In the past 12 years, the strategy of companies has changed a lot, come along with changes in the market, mostly because of the technolog What a good book for those who are interested in strategy. Very clear examples with many case studies on how some companies get a big profit by leaving the traditional red oceans of competitions for blue oceans where they are unique. it's a little bit unfortunately for me that I've recently read this book while it was actually published more than 12 years ago. In the past 12 years, the strategy of companies has changed a lot, come along with changes in the market, mostly because of the technology revolutions. So some ideas in this book become common sense nowadays. Ознакомившись со «стратегией голубого океана» я стал сомневаться в её существовании после того как конкуренты скопируют её модель. Постепенно, шаг за шагом автор доказал, что данная стратегия и множество эффективных тактических действий на пути её реализации приведёт к отсутствию конкурентов в рамках того же рынка. А автору всё таки же удалось развеять моё сомнение. Я не только поверил в СГО я взял все принципы с этой книги себе на вооружение. Рекомендую её всем предпринимателям, инвесторам и рук Ознакомившись со «стратегией голубого океана» я стал сомневаться в её существовании после того как конкуренты скопируют её модель. Постепенно, шаг за шагом автор доказал, что данная стратегия и множество эффективных тактических действий на пути её реализации приведёт к отсутствию конкурентов в рамках того же рынка. А автору всё таки же удалось развеять моё сомнение. Я не только поверил в СГО я взял все принципы с этой книги себе на вооружение. It was a booming marketing strategy that suddenly every body talked about. Even my 'ex' boss! With curiousity I bought this book to find out what is this so famous new marketing strategy?!?!? when I finally read the book, actually there is nothing new in it. It is actually the same strategy that I've learned in university. Mainly it talks about DIFFERENTIATION AND BEING DIFFERENT, that's it. Thanks God I didn't buy the original english version that cost a fortune!! Biznes janrına aid maraqlı bir kitabdır. Amma sadə dildən bir qədər uzaqdır, sanki daha çox dərslik xarakterlidir. Kitabın digər kitablarda olmayan unikal fikir, yanaşmasını bir səhifəlik yazıda ifadə etmək olar. Qalan hissələr isə başqa kitablarda da olan analizlər, müqayisələr, şirkətlərin tarixindən çoxsaylı faktlardır. Ao ser lido em 2015, este livro soa um tanto datado, seja por tudo o que se escreveu depois sobre negócios e estratégia, seja pelas empresas utilizadas como exemplo. Mesmo assim, fornece uma teoria bem interessante sobre estratégia de negócios que, mesmo em tempos de (já quase pós-) Lean Startup, ainda são relevantes. Bine, e clar cu principiile, acum urmează crearea unui ocean albastru al non-concurenței într-un domeniu de afacere. A decent but not groundbreaking explanation of how to beat your competition through value innovation: creating a leap of value for buyers while driving costs down. The book explains the theory and gives examples. There are many questions for you to ask yourself about your business. There are some helpful tables and graphs. The book is fairly dry, and not especially engaging. It's written for larger companies with mass-market products, so small businesses that provide services (like mine) need to A decent but not groundbreaking explanation of how to beat your competition through value innovation: creating a leap of value for buyers while driving costs down. The book explains the theory and gives examples. There are many questions for you to ask yourself about your business. There are some helpful tables and graphs. The book is fairly dry, and not especially engaging. It's written for larger companies with mass-market products, so small businesses that provide services (like mine) need to put some effort into translating the advice to their situation. According to the book, value innovation happens by 1) saving costs by eliminating and reducing factors and industry competes on, and 2) increasing buyer value by raising and creating elements the industry has never offered. "Although some blue oceans are created well beyond existing industry boundaries, most are created from within red oceans by expanding existing industry boundaries … In blue oceans, competition is irrelevant because the rules of the game are waiting to be set. It will always be important to to swim successfully in the red ocean by outcompeting rivals. Red oceans will always matter and will always be a fact of business life. … To seize new profit and growth opportunities, they also need to create blue oceans." The authors say the book is based on over 15 years of research in over 30 industries, data going back over 100 years, and HBR and academic articles. I read this to learn how to improve the positioning and marketing of my web design agency, OptimWise. The book was recommended by members of the uGurus Mastermind and in Zag: The #1 Strategy of High-Performance Brands. As a result, I expected this book to be more insightful. • Eliminate: Which of the factors that the industry takes for granted should be eliminated? • Reduce: Which factors should be reduced well below the industry's standard? • Raise: Which factors should be raised well above the industry's standard? • Create: Which factors should be created that the industry has never offered? • Divergence: uniqueness; differentiation from industry average. • Compelling tagline: deliver clear message; advertise an offer offering truthfully. 1. Look across alternative industries. Focus on key factors that lead buyers to trade across alternative industries (products and services with different functions and forms but same purpose. Give advantages of both alternatives. E.g., NetJets gives advantages of commercial airlines and private jet. 2. Look across the strategic groups within industries. Understand why consumers trade up or down among groups. E.g., Curves built on advantages of traditional health clubs and home exercise. Lexus offered quality of Mercedes at price of Lincoln. 3. Look across chain of buyers. Shift buyer group. E.g., Novo Nordisk focused on patients, not doctors. Bloomberg focused on traders and analysts, not IT managers. 4. Look across complementary products and service offerings. Define total solution buyers seek when they choose your product/service and think about what they need before, during, after they use your product. Identify pain points of your product and eliminate them through a complementary product. E.g., Barnes & Noble shifted from seller of books to seller of pleasure of reading and intellectual exploration, adding lounges and coffee bars. Dyson designed vacuum cleaners without cost and annoyance of changing bags. 5. Look across functional or emotional appeal to buyers. Functionally-oriented industries (those that compete on price and functionality with a rational appeal) can infuse commodity products with new life by adding a dose of emotion. E.g., Cemex shifted from selling bags of cement to selling a dream: adding a room to a house, where the family can laugh and be happy. Starbucks shifted from selling coffee to selling emotional atmosphere. 6. Look across time. Foresee how trends will change value to customers and change your business model, to take advantage. Study trends that have high probability of impacting your business, are irreversible, and have a clear trajectory. Predict what market will look like given the trend, then work backwards to identify changes to make today. E.g., Apple created iTunes to take advantage of trend towards mobile digital music. Cisco took advantage of growing demand for high-speed data. 1. Visual awakening. Compare your business with competitors by drawing your "as is" strategy canvas. See where your strategy needs to change. 2. Visual exploration. Go into the field to explore the 6 paths to creating blue oceans. Observe the distinctive advantages of alternative products and services. See which factors you should eliminate, create, change. 3. Visual strategy fair. Draw your "to be" strategy canvas based on insights from field observations. Get feedback on alternative strategy canvases from customers, competitors' customers, and non-customers. Use feedback to build the best "to be" future strategy. 4. Visual communication. Distribute your before-and-after strategic profiles on one page for easy comparison. Support only those projects and operational moves that allow your company to close the gap to actualise the new strategy. Talk to and observe customers, non-customers, users. Focus on non-customers and desegmentation before exploiting differences among existing customers. Seek to convert non-customers of the industry into new demand, rather than trying to capture greater share of existing industry customers. Seek key commonalities in what buyers value, rather than trying to embrace customer differences through finer customization and segmentation. 1. Why do first-tier non-customers watch to jump ship and leave your industry? Focus on commonalities and the segment buyers. 2. Why do second-tier to your non-customers refuse to you? Focus on commonalities. 3. Why is your industry not targeting third-tier unexplored non-customers? What needs do they have that you could meet? No tier of non-customers is inherently more valuable. Focus on the one that's the "biggest catchment" at the time. And see if there are commonalities across all three tiers. 1. Buyer utility: Is there exceptional buyer utility in your business idea? 2. Price: Is your price easily accessible to the mass of buyers? 3. Cost: Can you attain your cost target to profit at your strategic price? 4. Adoption: What are the adoption hurdles in actualizing your business idea? Are you addressing them up front? 6 utility levers: customer productivity, simplicity, convenience, risk, fun and image, environmental friendliness. Eliminate blocks to utility across the buyer experience cycle (purchase, delivery, use, supplements, maintenance, disposal). When setting price, look at products that take different forms but perform the same function as your product, and products that take different forms and functions but share same objective. You need price-minus costing to arrive at a cost structure that's profitable and hard for followers to match. • Streamline operations, reduce costs from a manufacturing to distribution. • Partner with companies to gain capabilities and economies of scale. • Change pricing model of industry. Creating blue oceans doesn't require tech innovation, even in tech industries. Key is value innovation (innovation linked to buyer's value). Creation of blue oceans contributes to strong, profitable growth and strong, positive effect on brand. W. Chan Kim is the Co-Director of the INSEAD Blue Ocean Strategy Institute and a Chair Professor of Strategy and International Management at INSEAD. His book Blue Ocean Strategy, co-authored with Renée Mauborgne, has sold 3.6 million copies and is recognized as one of the most iconic and impactful strategy books ever written. It is being published in a record-breaking 44 languages and is a bestsel W. Chan Kim is the Co-Director of the INSEAD Blue Ocean Strategy Institute and a Chair Professor of Strategy and International Management at INSEAD. His book Blue Ocean Strategy, co-authored with Renée Mauborgne, has sold 3.6 million copies and is recognized as one of the most iconic and impactful strategy books ever written. It is being published in a record-breaking 44 languages and is a bestseller across five continents.